WHITBOURNE, Sir RICHARD, sailor, merchant, colonizer, writer, governor of Sir William Vaughan’s colony in Newfoundland; baptized 20 June 1561 at Bishopsteignton, England, the son of John Whidborne, a yeoman, and his first wife, Agnes ———; m. Joane ——— (d. 1620), and they had two daughters; d. 1634 or 1635. From the age of 15 Whitbourne was a mariner, engaged in trading to most parts of western Europe. In 1579 he made his first voyage to Newfoundland, to catch whales and trade with the indigenous people. After this he visited the island frequently, being a witness both of Sir Humphrey Gilbert’s annexation in 1583 and of Sir Bernard Drake’s raid on Portuguese shipping in 1585. He commanded his own ship and three others against the Armada in 1588, subsequently receiving letters of recommendation from the lord high admiral, Lord Howard. His voyages to Newfoundland continued and, in 1612, Whitbourne was taken prisoner by “that famous Arch-Pirate,” Peter Easton, and two years later he saw the damage inflicted on the fishermen by Henry Mainwaring. 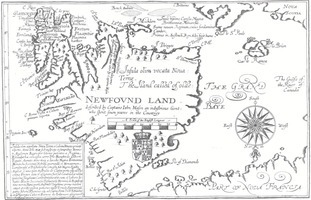 Early in 1615 he was commissioned by the High Court of Admiralty to hold vice-admiralty courts in Newfoundland and inquire into abuses committed by the fishermen. It was to correct these same disorders that John Guy, governor of the English plantation, had issued a series of laws in 1611. Whitbourne amassed evidence from 170 masters of English fishing vessels but, judging from later controversies between the colonists and the fishing merchants, his action was no more effective than Guy’s; indeed, it is difficult to see what one man could have been expected to accomplish. From this time Whitbourne’s interest in Newfoundland widened; previously it had been mainly commercial. In 1612, 1614, and 1616 he had ships there, which he intended should go directly to the Mediterranean with their fish. Now he became concerned with the island’s settlement and an advocate of the planters against the fishermen – a most unusual attitude in a West Country man who had himself been a fisherman. 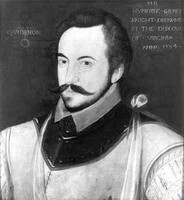 About 1617 he was consulted by William Vaughan, the first independent speculator to purchase land on the island from the London and Bristol company. Vaughan sent his first colonists out to Renewse in that year, and in 1618 Whitbourne sailed as their governor. He found that the settlers had been so ineffectual that they had not even built themselves an adequate shelter. Despite the hindrance caused to his plans by an attack on one of his ships “by an English erring Captaine” sailing with Sir Walter Raleigh, he succeeded in reorganizing the settlement. The Vaughan enterprise continued for some years but never with much success, and Whitbourne’s association with it seems to have ended by 1620 when he published his first Discourse and discovery of New-found-land. He had first submitted both his book and a proposition for a colony to the Privy Council. A committee appointed to consider whether a plantation should be assisted made no recommendation on this, but did approve the printing of the book and requested that the archbishops of Canterbury and York have it distributed in every parish. In 1621 the Privy Council asked for contributions from each parish to recompense him for his services and losses in Newfoundland. In 1622 a second edition of the Discourse appeared and he also published A discourse containing a loving invitation . . . to all Adventurers . . . for the advancement of his Majesties most hopeful Plantation in the New-found-land. This he dedicated to Lord Falkland, for he was now involved in the latter’s plan to establish a colony at Renewse. In December 1622 he wrote to Falkland, advising him on the financial organization and practical necessities of such a scheme. He recommended that a modest beginning be made in 1623 with only 12 settlers, all of whom should be craftsmen or fishermen. 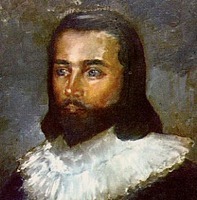 Between 1622 and 1626 he twice visited the colony, which was governed by Sir Francis Tanfield. In 1625 Whitbourne was knighted by Falkland, but by November 1626 he was looking for fresh employment. In a petition to the Duke of Buckingham he set forth his past services in Newfoundland and his fitness for further occupation there or elsewhere; this was supported by a reference from several prominent West Country gentlemen. He is next heard of serving as lieutenant on the Bonaventure under Sir John Chudleigh in October 1627, and in 1628 Robert Hayman published a poem in praise of his books. The exact date and circumstances of his death are not known. Scholars have stated that he drowned at sea, yet the bishop’s transcripts of the parish register for West Teignmouth, England, contain an entry for the burial of Richard Whitbourne in the churchyard of St James in August 1635. This record, along with a memorand concerning a January 1634 shipwreck near France of a vessel from Exmouth (where Richard had lived and owned property), has led author Richard Whidborne to hypothesize that Whitbourne might have been on that voyage and survived for a time in France, and that after his death his remains were repatriated. In any case, the existence of a Littleham manorial court record confirms that he was indeed deceased by 1 Sept. 1635. Whitbourne’s works are a unique contribution to the early literature on Newfoundland. Their purpose was always to stimulate interest in the island and, particularly, to promote its settlement as profitable both to the individual and to the nation. Yet their uniqueness lies not in their purpose but in their content; there were other propagandists but no other writer of the day could rival Whitbourne’s experience and knowledge or his ability to transmit enthusiasm. “What can the world yeeld,” he wrote, “to the sustentation of man, which is not in her [Newfoundland] to bee gotten. Desire you wholesome ayre? (the very food of life) It is there. Shall any Land powre in abundant heapes of nourishments and necessaries before you? There you have them. What Seas abounding with fish? What shores so replenished with fresh and sweet waters? The wants of other Kingdomes are not felt here.” (Discourse (1622), 75.) For his contemporaries he provided a wealth of detail on the geography, climate, and resources of the island, besides practical advice on settlement and the fishery; he even included a precise inventory of the cost of setting out a fishing vessel of 100 tons and 40 planters. For the historian he is an invaluable and lively source, reflecting the state of geographical knowledge and supplying important information on the method and organization of the fishery and the extensive trade in fish and oil. Whitbourne’s books are: A discourse and discovery of New-found-land (London, 1620), of which there is a MS draft in Whitbourne’s own hand in the BM, Add. MSS, 22564; A discourse and discovery of New-found-land: as also an invitation . . . (London, 1622), extracts from which appear in Westward hoe for Avalon . . . ed. T. Whitburn (London, 1870); (another ed., 1623); A discourse containing a loving invitation . . . (London, 1622), a small part of which is reprinted in M. Carroll, The seal and herring fisheries of Newfoundland (Montreal, 1873). There are two letters from Whitbourne to Lord Falkland: BM, Sloane MS 3827, ff.15–18, 67–68v. Other MS sources: BM, Add. MS 11033, ff.18–19v. PRO, S.P. 16/31, 81; C.O. 1/4; P.C. 2/29, 30, 31. DNB. R. Hayman, Quodlibets, lately come over from New Britaniola (London, 1628). Prowse, History of Nfld. W. A. Shaw, The knights of England (2v., London, 1906). For their assistance, the DCB wishes to thank the Oxford national dictionary of biography (London), the Newfoundland Historical Society (St John’s), and Jean and Mike Edwards, the GENUKI (UK and Ireland Genealogy website, www.genuki.org.uk) online parish clerks for Bishopsteignton Parish (Eng.). Devon Arch. and Local Studies Service (Exeter, Eng. ), 346M/M268--69 (manorial presentments), 1 Sept. 1635; 2202A/PR 1 (Bishopsteignton Parish reg. ), 20 June 1561; 2932A/PR 1 (Littleham Parish, Exmouth reg. ), 4 Sept. 1620, and memorand recording the names of those lost at sea on 5 Jan. 1634. Devon Heritage Centre (Sowton, Eng. ), DEX/7/d/1 Teignmouth, West EBT (bishop’s transcripts, 1615–1635), August 1635. Christopher English, “Whitbourne, Sir Richard (1561–1635): seaman and publicist for Newfoundland,” in Oxford dictionary of national biography: www.oxforddnb.com/view/article/29230 (consulted 19 Aug. 2015). 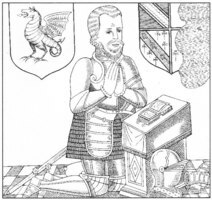 Richard Whidborne, Crosses & comforts: being the life and times of Captain Sir Richard Whitbourne 1561–1635 of Exmouth in Devonshire (St John’s, 2005). Gillian T. Cell, “WHITBOURNE, SIR RICHARD,” in Dictionary of Canadian Biography, vol. 1, University of Toronto/Université Laval, 2003–, accessed April 22, 2019, http://www.biographi.ca/en/bio/whitbourne_richard_1E.html.